Abd-ul-Aziz bin Abdul Rahman Al Saud (commonly known as Ibn-e-Saud) was the founder and first king of Modern Saudi Arabia which is the 3rd Saudi State. He re-conquered Riyadh (home city of his family) in 1902 from Al Rashid family and this event was the base of Formation of Modern Saudi Arabian while he later completed the establishment of Saudi Arabia in 1932. Abdul Aziz was born in Riyadh on 15th January 1876. His father Abdul Rahman bin Faisal was the last ruler of Second Saudi State (1818-1891). Riyadh was captured by Al Rashid family, the opponents of Al Saud family in Najd, in 1890 and they forced the Saudis to take refuge in the southern desert of Arabia. Later, Abdul Aziz and his family stayed in Qatar and Bahrain for some time but their last refuge area was Kuwait where they remained for around a decade. At the start of their exile, Ibn-e-Saud was just 15 years old. In January 1902, Ibn Saud captured Riyadh from Al Rashid with the help of just 40 men and this event started the unification of Saudi Arabia. From 1903 to 1907, Saudi-Rashidi War was fought for the control of Qassim region (north of Riyadh). Rashidis were ally of Ottoman Empire and they were helped by the Ottomans during this war. But Saudis completely defeated the Rashidis during this war. Ottoman forces were crushed by the Saudis during the Battle of Rawdat Muhanna (1906) in the Najd area while these Saudis, under the command of Ibn Saud, completely conquered Qassim region after Battle of Tarafiyah (1907). In 1921, Al Saud captured Hail (northern Nejd) from Al Rashid dynasty which marked the end of Al Rashid dynasty and Ibn Saud became the ruler of whole of Najd region. Abdul Aziz Al Saud captured the areas of Najd and eastern coast of Arabia till 1912. Then he founded the religiously motivated tribal force of Ikhwan (brotherhood) with the help of Salafi religious scholars. This force helped him in the later conquests including the 1913 conquest of al Hasa (eastern oasis region) from the Ottomans. In 1915, Ibn Saud signed agreement (Treaty of Darin) with British through which he assured them not to attack British protectorate areas except the Hejaz area which was also a British protectorate area under Sharif of Makkah (Hussain bin Ali). In exchange, the British provided him weapons and other support. In 1925, Ibn Saud captured Makkah from the Hashemites which ended the centuries’ long rule of the Hashemite dynasty from Hejaz and Ibn Saud became the ruler of Hejaz also. The British accepted the rule of Ibn Saud over Hejaz through Treaty of Jeddah (1927) and Abdul Aziz in exchange accepted not to enter the British Protectorate areas. But Ikhwan refused to accept the condition and rebelled against the Saudis. Their rebellion was crushed in 1929 after Battle of Sabilla. Their leaders were killed and the remaining soldiers merged in to the regular Saudi army. 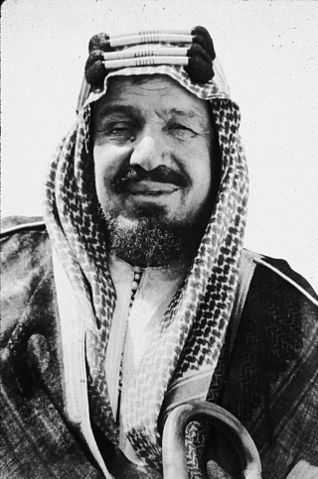 In 1932, Ibn Saud established Kingdom of Saudi Arabia, which is the current and Third Saudi State, and he himself became its first king. Abdul Aziz ibn Saud remained the king of Saudi Arabia till his death in 1953. During that time, the monitory position of the state changed due to the discovery of petroleum which helped to eliminate nomadic lifestyle by the Arab tribes. He introduced and enforced the Salafi ideology of Islam in the whole state which is the ideological base of the Saudi state. It was helpful to eliminate social crimes in the state. During World War 2 (1939-45), Saudi Arabia remained neutral while the state participated in 1948 Arab-Israel War as member of Arab League. He established good relations with USA, especially after the World War 2. Abdul Aziz ibn Saud died on 9th November 1953 in Taif and buried in his birthplace Riyadh. King Abdul Aziz (Ibn-e-Saud) was one of the most influential figures of Muslim and international politics of 20th Century. His bravery and intellect played an important role in the Formation of Modern Saudi Arabia which looked to be an impossible task after the exile of the Al Saud tribe. His teachings to his family have great importance in the political stability and smooth succession of power in the Saudi state.